How is Happy Dog Naturals different? We're specialists in curing mange. It's all we do. When a dog suffers with mange, their people suffer too. Our job is to help both 2- and 4-legged family members through a difficult situation. Our heartfelt goal is to save dogs that would otherwise continue suffering from mite infestations, be subjected to risky and possibly dangerous treatments, or even worse outcomes. Since we started in 2010 and we’ve helped change the lives of thousands of dogs and their caring owners. Our customers are wonderful evangelists that have been spreading the word. And for that we are extremely grateful. We think we’ve built a following of raving fans for a couple of reasons. 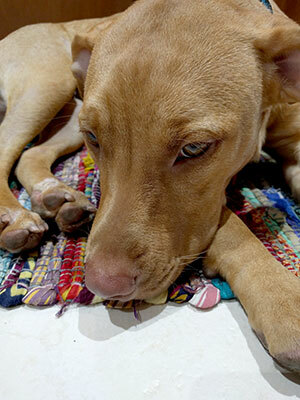 One – we seem to have hit a nerve by providing a valid choice to people who are searching for a safe mange treatment. Two – from what we hear, apparently it’s something about the way we do things here. Not everyone wants to use toxic chemicals on their pet. For those who shudder at the concept and those who have been let down by traditional mange treatment, we offer a safer way to cure mange and get their ‘happy dog’ back. Our rescue dog "Mangey Marley" is now mange free. Every day, more and more people are becoming enlightened about their safety and they want choices. People usually find us when they go looking for a healthier or alternative way to cure their dogs’ mange. Mite Avenge® and our other Happy Dog Naturals® products are unique in formula and approach. Natural ingredients, particularly the essential oils we base our brand on, have been proven again and again to work exceptionally well. And all those other products in our store? (Which hopefully you’ve noticed.) Our offerings are restricted to helpful items meant to give you a full toolbox to win the battle against mites naturally. It’s not just the products. An inseparable part of our, and our customers’ success stories is the way Happy Dog Naturals operates. We’re purposefully focused on a business model that’s the complete opposite of the drug industry. 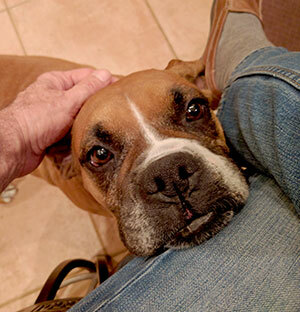 It’s not about building a big corporation – it’s about the dogs. Happy Dog Naturals uses specialized ingredients and processes that other manufactures can’t or won’t handle. Therapeutic grade organic and natural ingredients, especially good essential oils, are significantly more expensive than synthetic ones. Fragile ingredients mean our products must be small-batch compounded in stages under low-light conditions using close-tolerance temperatures and nothing can ever come in contact with metal. Then there’s a packaging process using customized no-metal equipment and special food grade, light-blocking containers. Certain components like herbal infusions can take up to six months to make. Dakota checks incoming supplies - could be cookies in those boxes. Mange is a complicated and serious disease. You need to know what you’re up against in order to make responsible decisions as your pet’s health advocate. And it’s hard to step outside the comfort zone of traditional care and try to heal your beloved pet alone. You need answers. We’ve gone out of our way to put together a wealth of information to help you all in one place. We hope you’ll take advantage of learning resources whether you use our products or not. We care. That’s all that matters really. Some days it’s a roller coaster ride. But when we get one of those fabulous ‘after’ pictures that people sometimes send us, it’s worth it. We’re a small family company that got started because Pete was in the same position you’re probably in now – it was upsetting that there were no alternatives or learning resources. Pete gets some inspiration (and love) from Matrix. The office is full of animals, when we make mistakes we own them, everyone here is either related or should be. For example, our lead customer service rep is the owner’s son and our head tech was his best bud when they were four years old. The entire production team is a different verse of that same song. It’s an emotionally invested dog loving team. Mite Avenge® and Happy Dog Naturals® came to be when Pete Blews was fighting for his dog’s health. Belle had mange and she’d been through it all. Steroids, antibiotics, and drugs – nothing helped. Finally, after being told to “learn to live with your dog’s condition or put her down” he decided to find a way to help her on his own. With no effective natural cure available, out of desperation, he formulated one. Pete’s wife, Cindy Ritchie, now owns the company and the original Mite Avenge formula has only gotten better. Along the way a little company and an inspired line of safe natural products just for treating mange has evolved.